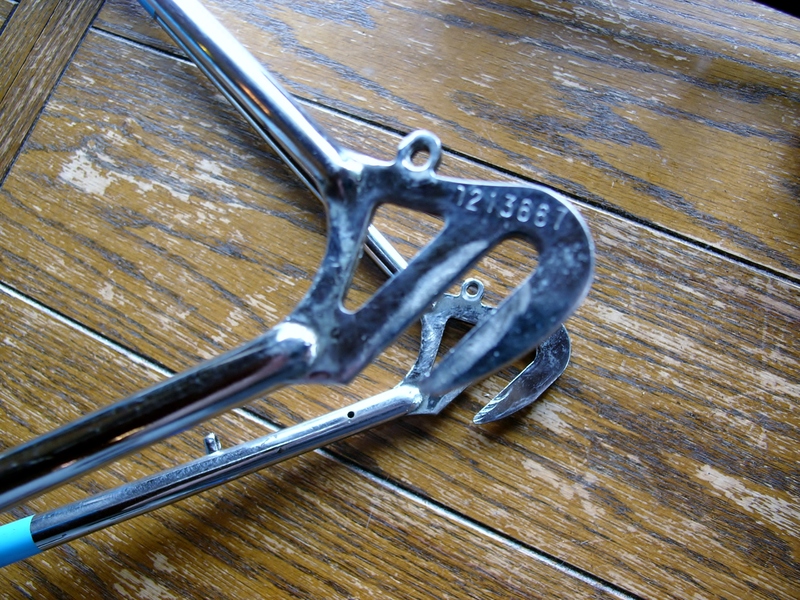 Early 1950’s Simplex dropout – long, horizontal, with eyelet. Rear dropouts determine what derailleur options are available for a given frame. 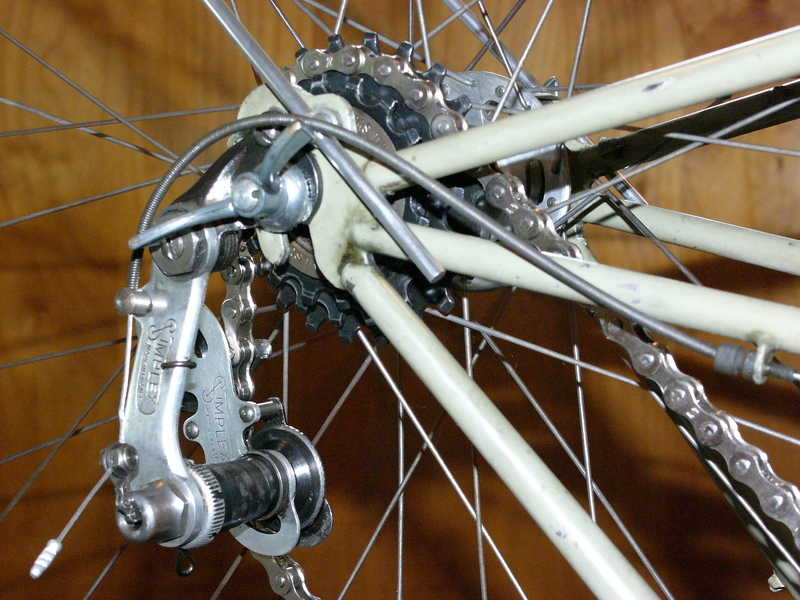 Rear dropout spacing also determines hub options, with derailleur equipped vintage bicycles having narrower spacing than their modern counterparts. And, the shape and style of the dropout are important as well: horizontal dropouts allow for wheel adjustment fore and aft, whereas vertical dropouts make rear wheel removal easier. Eyelets on the dropouts mean integrated fender and rack mounts, a definite plus. Little attention is paid to this important feature of any vintage steel bicycle. 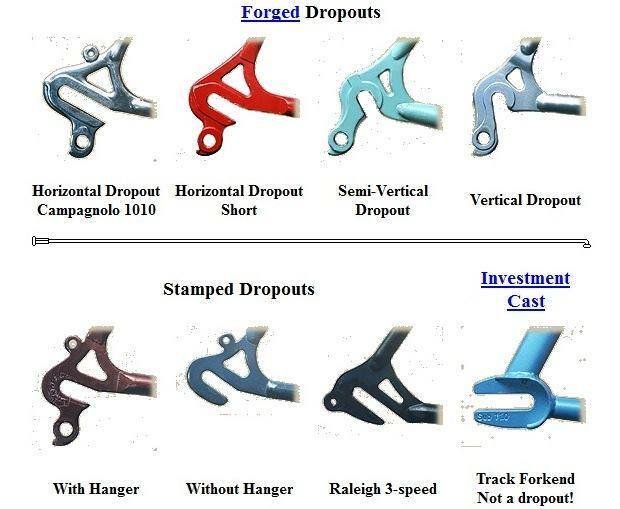 Vintage dropouts include: old style Simplex dropouts (shown above – but often model specific), newer style Simplex dropouts, Huret drop outs (several styles), Campagnolo dropouts, Shimano and Suntour dropouts, and stamped or forged dropouts with no integrated derailleur hanger. Some vintage bicycles feature chainstays with integrated braze-ons or dropouts for Simplex, Cyclo, Huret and other rear derailleurs. 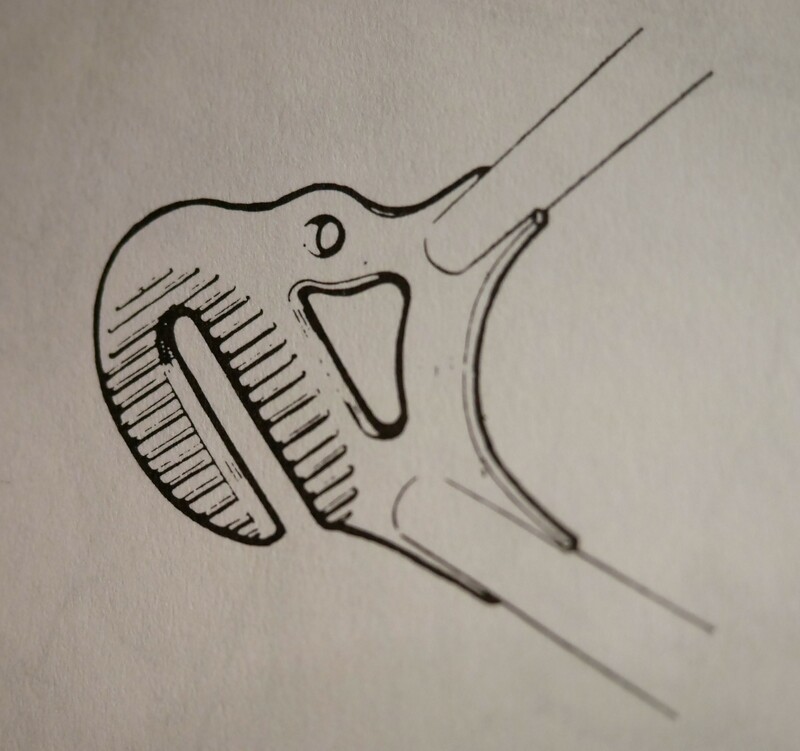 Plain dropouts require a “claw” attachment for the rear derailleur or a braze-on or clamp for the chain stay. 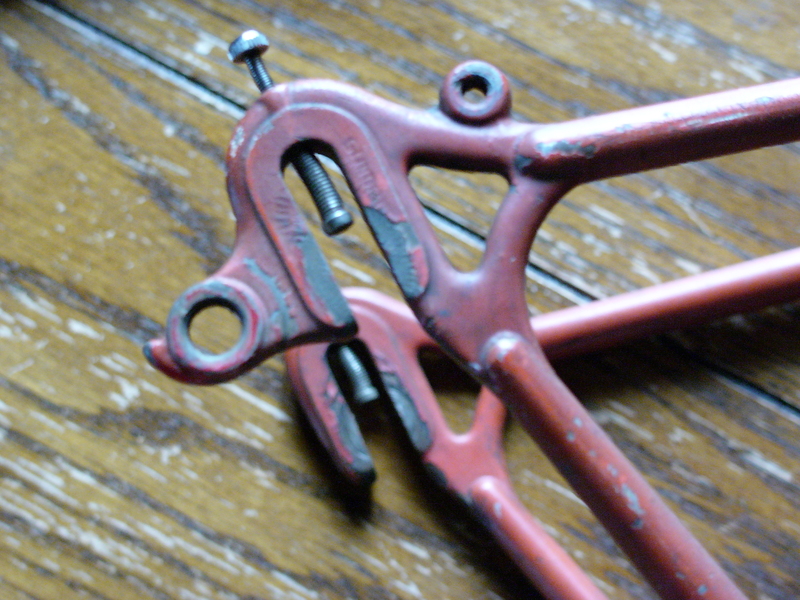 For vintage bicycles, plain dropouts without a hanger do not in any way indicate a lower end frame. Many nice upper end vintage steel frames did not have manufacturer specific brazed dropouts. So, do not be afraid of the “claw”. 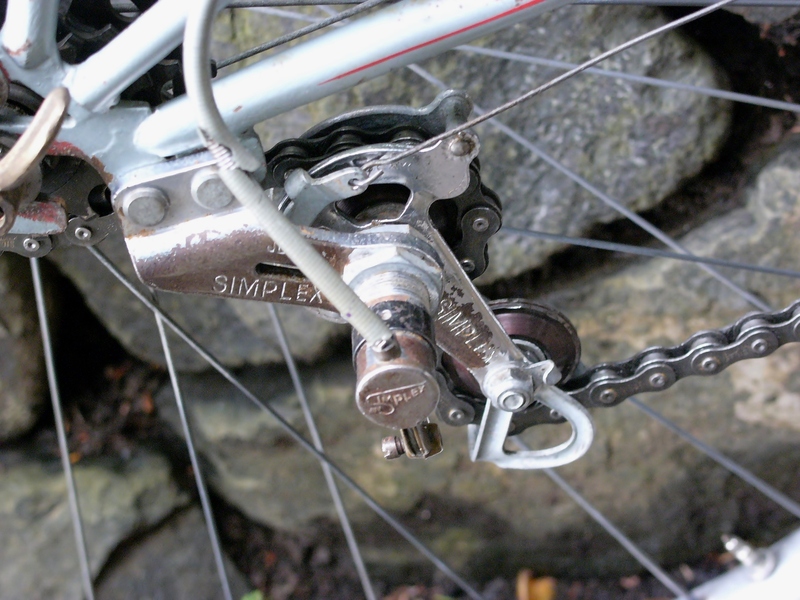 In fact, having plain dropouts on a vintage bicycle can be helpful, because derailleur options are automatically expanded, depending on the style of claw chosen. 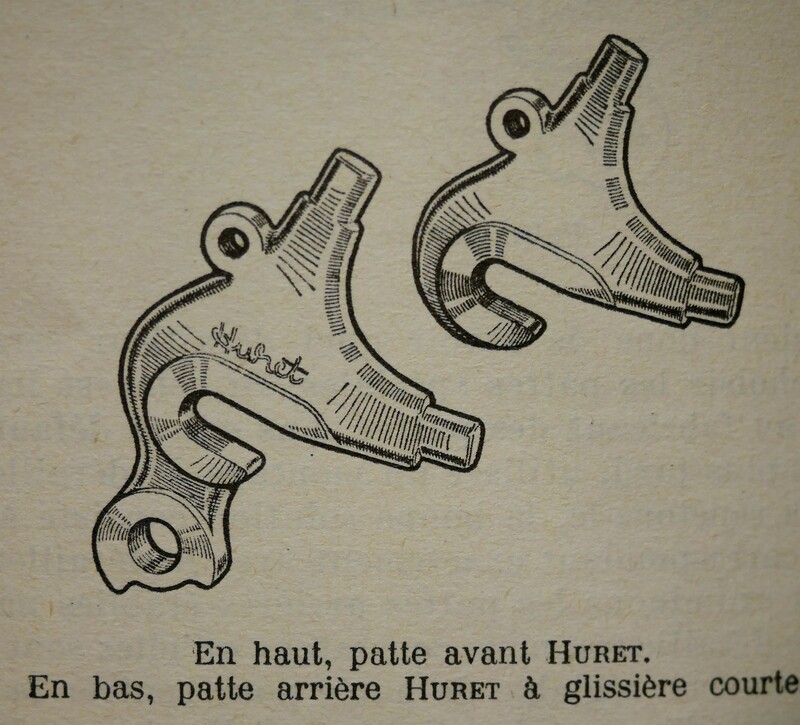 The above Daniel Rebour drawings depict two different styles of Huret dropouts. 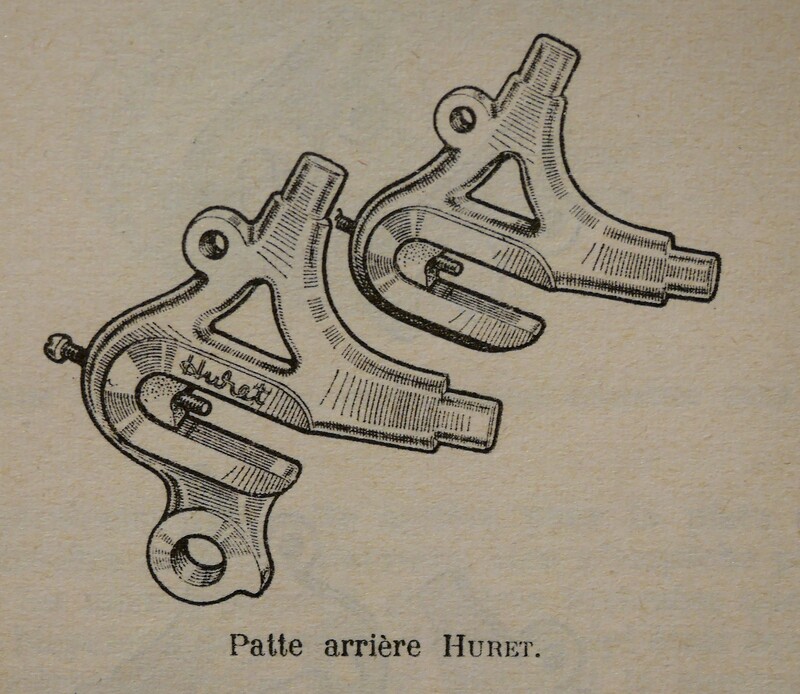 Huret rear derailleurs can be a bit (translate “a lot”!) more difficult to set up than Simplex derailleurs. By contrast, setting up Shimano, Suntour or Campagnolo derailleurs with their matching tabbed and threaded dropout at 7 o’clock seems almost too easy. After the early 1980’s or so, dropout hangers were not so much an issue, because dropouts on derailleur equipped bikes after this point in time featured standard Shimano/Campagnolo hangers which were adopted as the standard by other component manufacturers. Sheldon Brown developed this helpful chart shown above, although it is missing some key information. He does not address the baffling array of hanger styles which existed in days of yore. 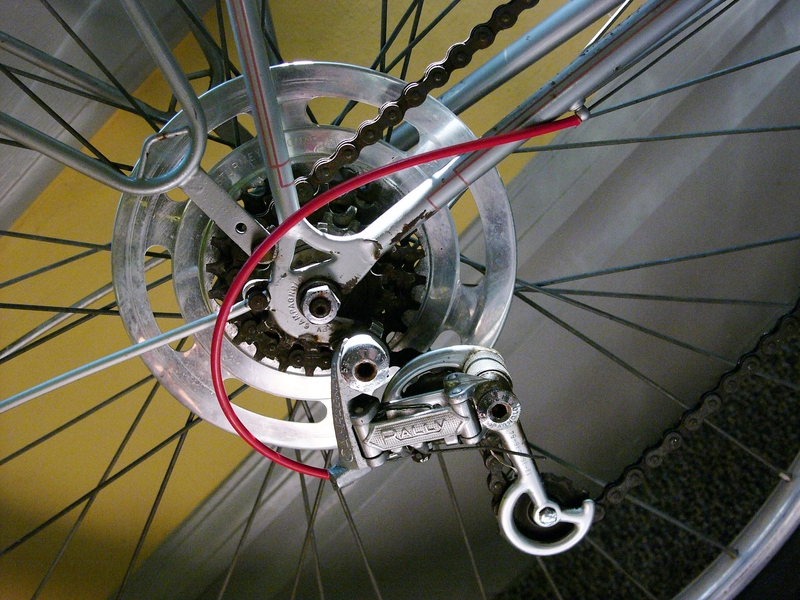 A Simplex early style dropout with tab on the non drive side. There is only one resource on the web that seems to have a comprehensive overview of dropout styles and rear derailleur compatibility issues. This helpful chart can be found at a site called The Headbadge. 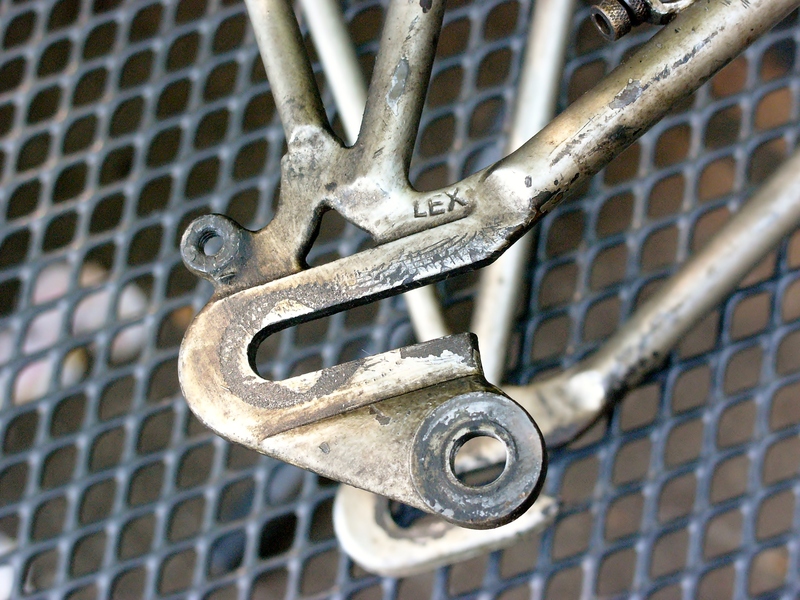 Velobase also has an extensive database of vintage style dropouts. 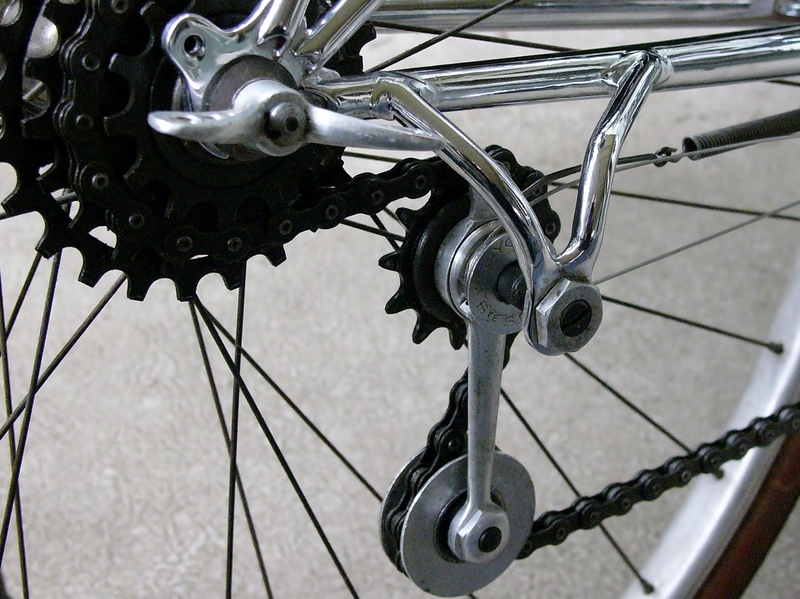 These resources can help anyone restoring a vintage bicycle determine whether and how to change the existing rear derailleur, and how to determine compatibility options. An early 1978 article on derailleurs and dropouts by Sheldon Brown, with interesting discussion of Type H and Type S rear derailleurs. An historic overview of gear selection options through the decades by Bainbridge Classic Cycles, featuring an interesting photo of a freewheel with moveable cogs and a stationary rear derailleur. The Dancing Chain by Frank Berto is also an important resource – even more so because it is in book form. If you don’t want to explore vintage derailleurs and dropout styles, the information presented in Chapter 15 – “How Derailleurs Work” will be worth the cost of purchasing this book. 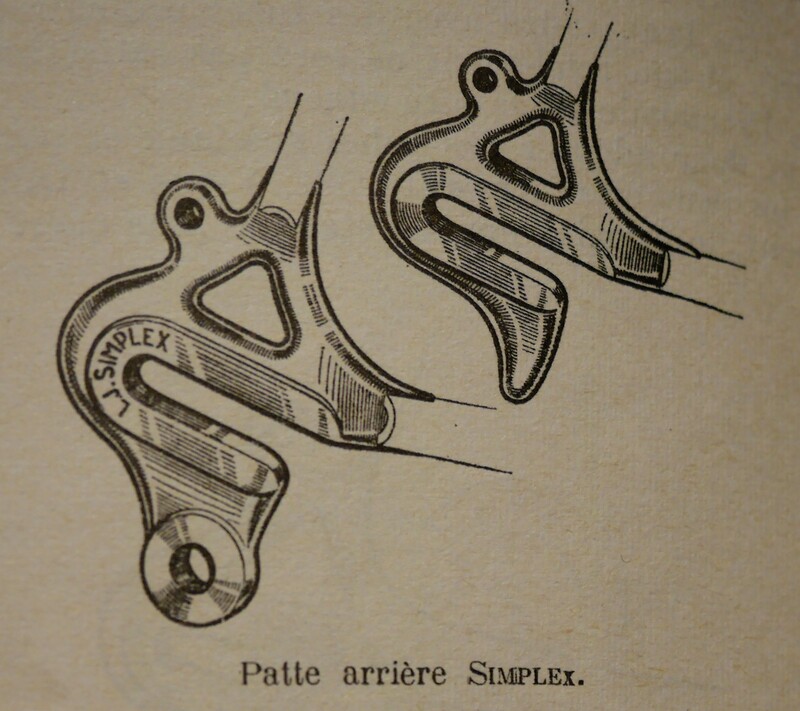 The author’s discussion of derailleur composition, chain gap, pulley spacing, cage geometry, and spring loaded pivots is invaluable to an understanding of how derailleurs work. This entry was posted in Bicycle history, Bicycle restoration, Simplex derailleur, Simplex Tour de France, Vintage bicycle, Vintage bicycle restoration, vintage Camapagnolo, Vintage French Bicycle and tagged bicycle dropouts, Campaganolo dropouts, derailleur selection, huret dropouts, Shimano dropouts, simplex dropouts, Suntour Dropouts by Nola Wilken. Bookmark the permalink. Nola, I have a question. What does GT mean with SunTour dropouts?